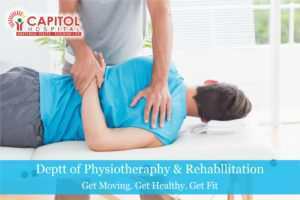 Capitol hospital has a complete and fully equipped Physiotherapy department spread over an area of 4000 square feet. It caters to people with varied ailments aiming at improving their daily quality of life. The physiotherapy department has the record of being one of the best in the region when it comes to patient recovery. The rehabilitation team works with you to ensure that your need for privacy, dignity and confidentiality are met well. Professional physiotherapists and rehabilitation experts in the department design programmes for speedy recovery, health and wellness to the individuals. We also deal with problems ranging from sports & trauma injuries, arthritis management, posture correction, frozen shoulder management and low back pain to serious neurological injuries such as spinal cord injury or brain injury. The team is responsible for providing pre-operative and post-operative physiotherapy intervention to out-patient and in-patients. The hospital has a dedicated & comprehensively equipped fitness center available for exercise and rehabilitation. Capitol’s team is dedicated to help patients to gradually improve by reducing pain, increase flexibility and mobility.